Microbial VOCs and Health – report from Basel conference Indoor Microbiome Symposium – microBEnet: the microbiology of the Built Environment network. Many indoor environmental investigators have attempted to use volatile organic compounds (VOCs) emitted by microbes as an indicator of the presence or potential health relevance of the indoor microbiome. These compounds emitted by microbes are generally referred to as MVOCs. The airborne concentrations of MVOCs is usually too low for characterization by the usual indoor air VOC sampling and analytical methods, but extraction of MVOCs from dust appears to be an effective way to identify and quantify the presence of MVOCs indoors. Of course the MVOCs in dust will not be representative of all MVOCs present since those on dust are in the “condensed phase” (non-gasesous) and what is found on dust will be skewed toward the less volatile compounds (those with the lowest vapor pressures). 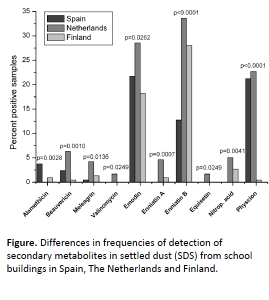 Martin TÃ¤ubel of the Finnish National Institute of Health and Welfare reported on a study of microbial VOCs that was part of the European Commission’s HITEA project (“Health Effects of Indoor Pollutants”). The HITEA project’s aims include integrating microbial, toxicological and epidemiological approaches. The HITEA project includes a study of 99 schools in Amsterdam, Barcelona, and Helsinki. 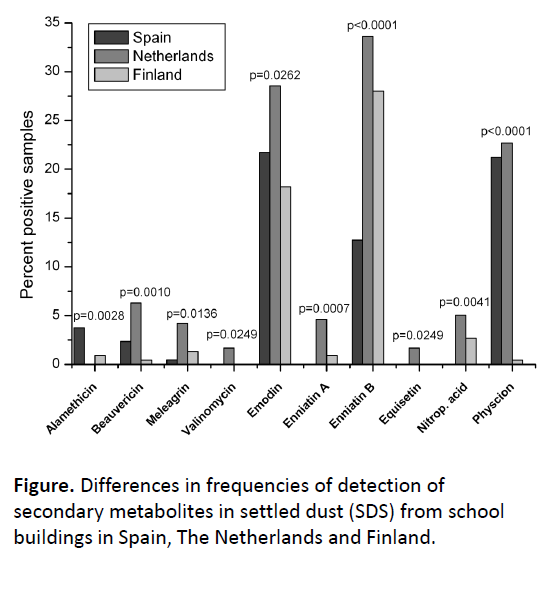 In each country, at least 10 schools with and 10 schools without reported dampness, moisture damage, and/or visible mould were included from each country — the included schools were within a convenient geographical distance to the conducting study centers. – The results raise questions about the relevance of outdoor sources on the occurrence of microbial toxins indoors. – An effort to investigate the health implications of the presence of MVOCs resulted in limited evidence of a health effect and questions as to whether there is actually any difference between the effects of exposure to MVOCs from outdoors and those from indoors. In his presentation, TÃ¤ubel summarized results from a paper from the HITEA project by Peitzsch et al (TÃ¤ubel is a co author) reporting some of the early results of the HITEA project. We are genome sequence and analysis company. We have pathways for metabolic and non metabolic pathways. We would be happy to be a service provider if researchers would need.